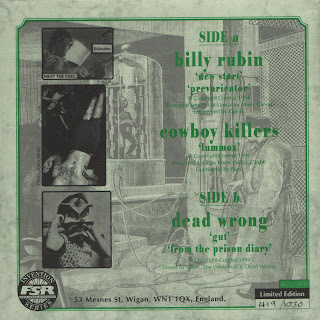 Billy Rubin/Cowboy Killers/Dead Wrong - Split E.P. Split single/E.P. from 1994. 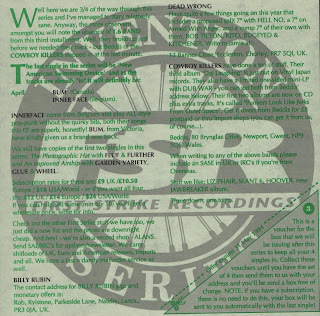 Part 3 of a snazzy box set type affair from 'First Strike Recordings'. I only own this one. Number 3. Mainly for the Cowboy Killers track 'Lummox'. 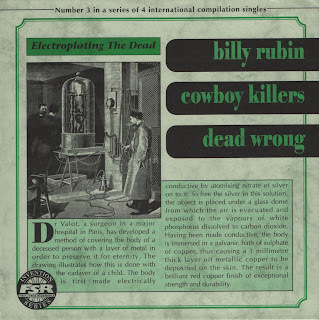 Also featured are, Billy Rubin, who give us some nice Albini-esque noise. And John Peel much played, Dead Wrong, who give us some early Rollins Band/No Means No, type noise. See, there was life in the early nineties! Clicking the covers makes them look really big & stuff. Subhumans were bloody fantastic on Wednesday by the way. Your English is fine sir! I've added your link. Nice stuff you have posted.